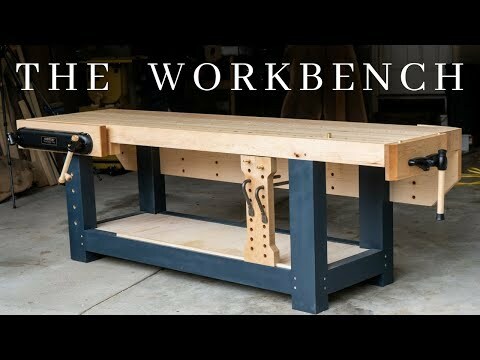 How to make the PERFECT woodworking workbench! This massive hybrid bench (part French Roubo, part German Holtzapffel, and part English Nicholson) gives you the ultimate in work holding abilities! Hardwood lumber packs for this workbench are available to be picked up in store or delivered to your house anywhere in the US by Johnson's Workbench. They will mill the lumber for FREE, and if you order before 9/9/2018 you will get an additional discount on the lumber. They straight-line rip one edge, mill flat and smooth both faces so all you have to do is follow the plans and rip the boards to proper width, cut to length, glue up, cut joinery, and assemble. No further milling should be needed. *Prices do not include shipping or tax as those will vary from location to location. "VERITAS BENCH DOGS, PRAIRIE DOGS, ACCESSORIES"